For years international media outlets worked collaboratively with WikiLeaks to publish leaked files on subjects ranging from the Iraq and Afghan wars to Syria to State Department diplomatic cables, but now it's WikiLeaks itself that media outlets are attempting to expose. An exclusive Associated Press story claims that WikiLeaks founder Julian Assange sought to obtain a Russian visa as his legal troubles and pressures from Western politicians grew. This comes after US officials have long sought to smear Assange as a Russian asset and the WikiLeaks organization as a whole as working with Russian intelligence. The AP has published a letter it says is from a WikiLeaks laptop and penned by Julian Assange only days after the group made world headlines by publishing hundreds of thousands of US diplomatic cables in 2010, however WikiLeaks immediately disputed the authenticity of the letter. The letter, though unsigned, is dated from Nov. 30, 2010 and is said to prove that Assange was giving serious thought to moving to Russia at the time, presumably to ensure he wouldn't be apprehended by police or intelligence agencies in the West. It was a couple of years prior to Assange's seeking refuge at the Ecuadorian embassy in London; however, his international stature as a controversial figure was rising and Sweden was building a legal case against him for sexual assault allegations. The AP published the letter Monday as part of what's described as "a much larger trove of WikiLeaks emails, chat logs, financial records, secretly recorded footage and other documents leaked to the AP". More significantly, the AP frames the internal messages of the controversial organization as "an early hint of Assange’s budding relationship with Moscow" — a theme which the organization's many enemies, including leading Democrats, have emphasized especially after the election of Donald Trump. 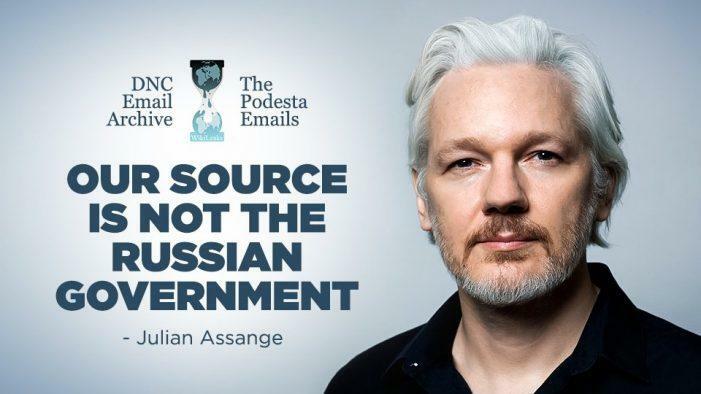 Over the years Assange has consistently and vehemently denied associations with Russian intelligence; and has further hinted the DNC leaks came from within the Democratic Party. 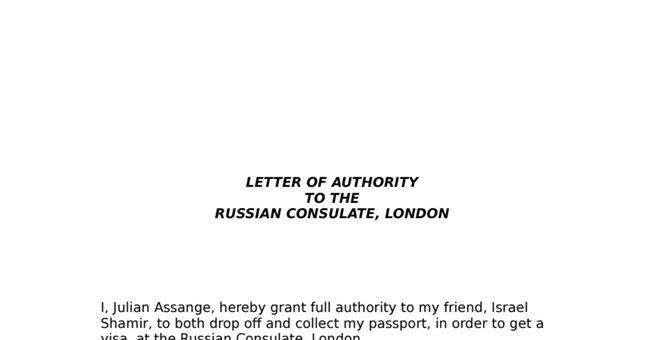 The letter's contents show that a WikiLeaks associate named Israel Shamir was authorized to deliver the request to the Russian consulate in London. The AP also published a page which purports to prove that WikiLeaks had the letter notarized at the time using a copy of Assange's passport for identification. Meanwhile WikiLeaks on Monday slammed the letter as fake, saying in a statement published to Twitter: Mr. Assange did not apply for such a visa at any time or author the document. The source is document fabricator & paid FBI informant Sigurdur Thordarson who was sentenced to prison for fabricating docs impersonating Assange, multiple frauds & pedophilllia. For its part the Russian Embassy in London told the AP that it never discusses as a matter of policy who applies for a visa and who doesn't. The AP report describes the tens of thousands of files now in its possession as possibly "the biggest leak yet" on the transparency organization. And further that: "The AP has confirmed the authenticity of many of the documents by running them by five former WikiLeaks associates or by verifying non-public details such as bank accounts, telephone numbers or airline tickets." However, concerning the alleged WikiLeaks "Russian connection" — it is unlikely that there's anything damning on this front, otherwise the AP would have published it first. In 2013 NSA leaker and whistleblower Edward Snowden obtained temporary asylum status in Russia after fleeing arrest. Snowden's enemies too have accused him of being a Russian asset due to his ending up in Moscow after going public with the leaks from a hotel room in Hong Kong.